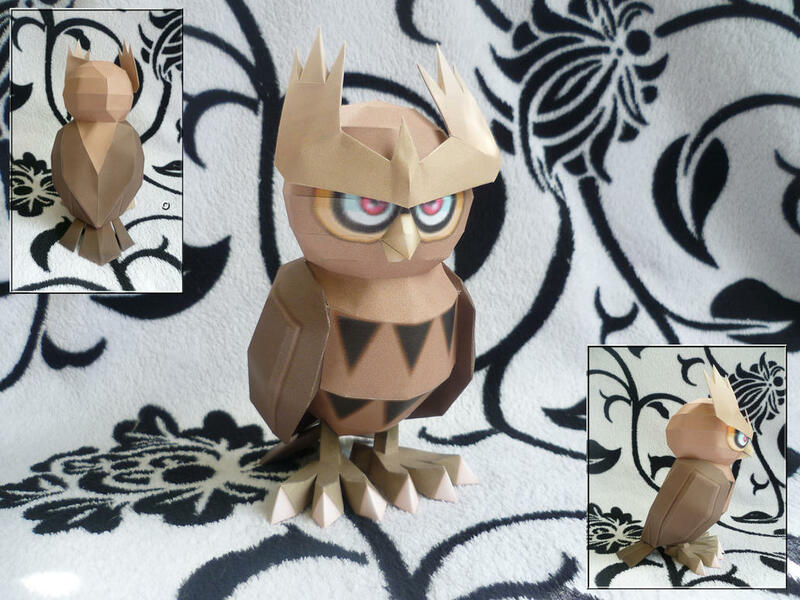 Noctowl looks much like a 'normal' owl, with a brown coloring and a triangle pattern of a darker shade of brown running down its chest. Its wings and wedge-shaped tail are dark brown like the pattern on its chest, although the underside of its wings is the same light brown as most of its body. It has bushy, cream-colored feather 'horns' that look similar to a trident or eyebrows. The ring pattern around its eyes and its talons are cream in coloration, and Noctowl's beak and the nails of its talons are light pink. Additionally, Noctowl's irises are red. It evolves from Hoothoot starting at level 20. Instructions: Start by building the horns/eyebrows, then build the head and beak, and attach the two together. Build the Body, and then the wings. Close it by building the piece on the back, between the wings. Finish the model by building the tail and the feet. Notes: Attaching the Tail might be a little hard, but try your best. This model was testbuilded by Dodoman75 (up), and Me (below). Thanks for building, Hope you Had fun!